Brand New Special Edition Focus RS Mk2 Thermally Coated Tips by Milltek Sport. With the choice of either the Polished or the New Blackline tail pipes and now the choice new resonated centre section to reduce noise this new Cat Back System is the system of choice for the professional and will be the one to beat on Quality, Tone and sheer Desirability. The Special Edition tips available in the first batch will be the same size and fittment as the Std tips and will flow with the form and superior angles of the crowning jewel of the rear bumper. 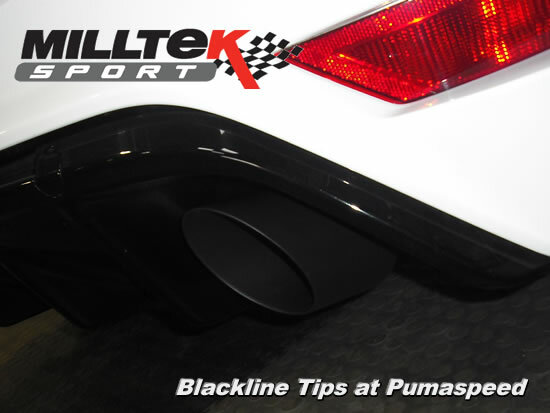 The Blackline Tips allow extended running at high boost and have been designed specifically for the New range of 400 and 420 bhp conversions currently in development at Pumaspeed. The Pumaspeed Workshop team are ready to fit the SPECIAL OFFER Black Line tipped Milltek Sport Focus RS Mk2 2009 Cat Back MotorSport Exhaust in our Head Office located here. Therefore making parts and labour a total cost £835.09 (inc. VAT). Pumaspeed have a specialist distribution team that can dispatch the SPECIAL OFFER Black Line tipped Milltek Sport Focus RS Mk2 2009 Cat Back MotorSport Exhaust to any destination worldwide.